Click here to learn about our classes. 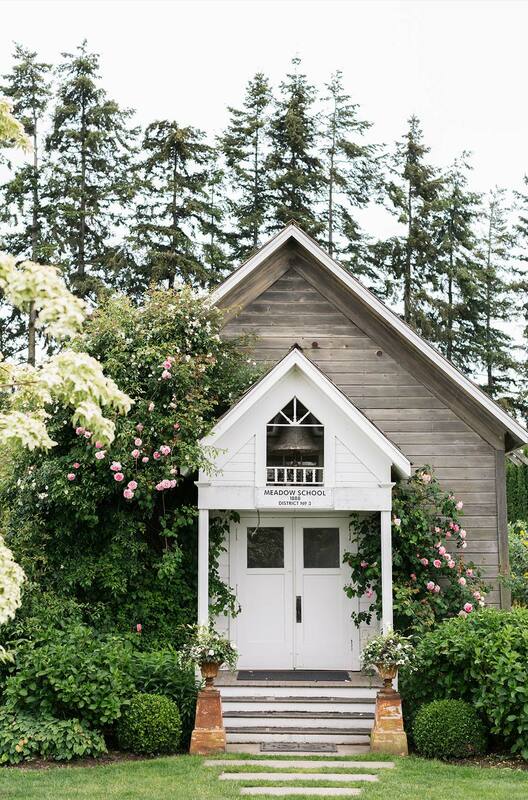 Christianson’s Schoolhouse is a poetic venue for your garden wedding. Intimate and elegant, the artfully restored Meadow Schoolhouse accommodates ceremonies with up to 50 seated guests and is the oldest remaining one room schoolhouse in Northwest Washington. The English-styled Rose Garden offers a secondary ceremony site and accommodates up to 150 guests outdoors amidst a sweeping grass lawn lined with perennials, boxwood and espaliered apple hedges while surrounded by views of Mount Baker and the panoramic farmland of Skagit Valley. Celebrate with your bridal party in our quaint, vintage-styled Bridal Cottage equipped with vanity, outlets, mirrors, “Jill” access to the restroom just steps away from the Schoolhouse and new for 2019, our Changing Quarters, just steps away from the Bridal Cottage. Follow us on Facebook, Instagram and Pinterest. Sign up to receive great content, deals, and be part of the 12 thousand like-minded gardening subscribers!